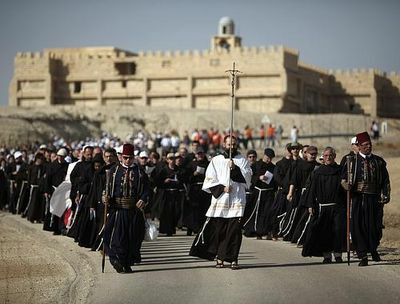 In contrast to previous years, however, pilgrims can now visit the site any day they want. Since the Six Day War in 1967, the area had been a closed military zone, open to visitors only twice a year or by appointment. In recent years, however, the Israeli Ministry of Tourism has invested millions to develop the site as a major pilgrimage center. It reopened on July 12 and is now open to the public seven days a week. Known in Arabic as Qasr al Yahud (castle of the Jews), the site is located only a forty-minute drive from Jerusalem. 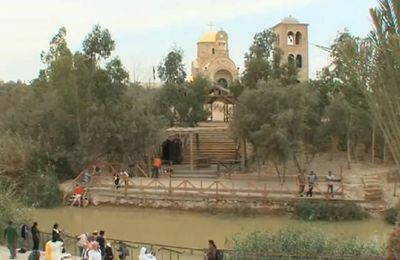 It is most likely the site where Jesus was baptized by John the Baptist just before beginning his public ministry. The site was already known as a holy place in the fourth century A.D. This is attested by the remains of several byzantine churches in the area which display some beautiful mosaics, marble steps leading to the water, and a unique baptismal pool. All four gospels recall the story of Jesus coming to the Jordan to be baptized by John. The synoptics record that when Jesus was baptized, the Holy Spirit descended upon him like a dove, and a voice came from heaven, saying "This is My beloved Son, in whom I am well pleased" (Mt 3:13-17; cf. Mk 1:9-11; Luke 3:21-22). The Gospel of John tells us where the scene occurred: “These things took place in Bethany across the Jordan, where John was baptizing” (Jn 1:28). Jesus also stayed in the same “Bethany beyond the Jordan” (not to be confused with Bethany on the Mount of Olives), when he later fled persecution in Jerusalem (Jn 10:40). 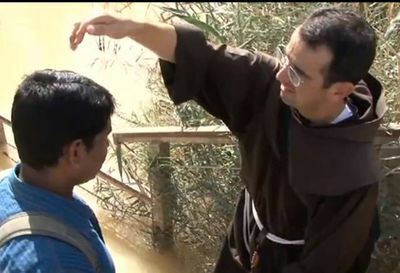 What is the symbolism of Jesus being baptized at this spot? This is the same place, not far from Jericho, where the Israelites crossed the Jordan when they entered the land of Canaan. As the priests carrying the Ark of the Covenant stepped into the river, the waters of the Jordan were cut off and the Israelites could cross it on dry ground (Josh 3:14-17). Later, the prophet Elijah crossed the Jordan on dry ground with Elisha just before he was taken up to heaven on a chariot of fire (2 Ki 2:8) as a sign that his prophetic ministry was over. Elisha then returned to Israel in the same way, crossing the Jordan on dry ground to inaugurate his own prophetic ministry (2 Ki 2:14). The fact that Jesus also began his ministry there, by “crossing the Jordan,” portrays him as a “new Joshua” (the two names in Hebrew, Yeshua and Yehoshua, are almost the same), who was about to begin his prophetic ministry to Israel and to the world, leading them to the new Promised Land of forgiveness and eternal life in heaven. And for every Christian following the lead of Jesus, the door to this life is through the waters of baptism, as celebrated at the Jordan.